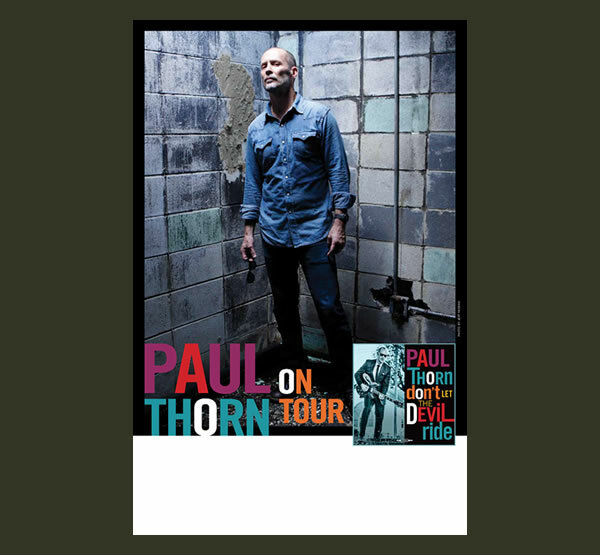 This tour poster features a 2018 promotional image of Paul along with the Don't Let The Devil Ride album cover. Poster size is 11" by 17". This tour poster features Paul's cover image from the Don't Let The Devil Ride album. Poster size is 11" by 17". Get an actual tour poster from Paul's 2017 Hammer & Nail anniversary shows on quality paper. Poster size is 11" by 17". In 2017 we commemorated the 20th anniversary of Paul's first album, Hammer & Nail. Help us celebrate by slapping this beauty on your fridge next to the grocery list. The Paul Thorn Band "road sign" tour poster from 2016 on quality paper. Poster size is 11" by 17". This is a limited edition print coming to you on high quality art paper at 17" x 22". Only 500 will be printed and each one is signed and numbered by Paul Thorn. "Here is the story of Thunderbolt Brown. He isn't a real person. I created him in my mind. However, I believe we are all a lot like him. None of us are truly worthy of Heaven's rewards. According to the Bible, our righteousness is no better than a filthy rag. So humble yourself before it's too late. Learn to love and don't be quick to judge. This is a Limited Edition 17" x 22" art print. They are signed and numbered by me." This lithograph of Paul Thorn's artwork for the cover of What The Hell Is Goin' On? is 12.5" by 12.5" and it is numbered and signed by Paul. Take the button below or click on the image for a better view. This lithograph of Paul Thorn's artwork for the cover of Pimps and Preachers is 12.5" by 12.5". Take the button below or click on the image for a better view. What can we say? It's a koozie. But it features the Paul Thorn Band logo and a reminder to cultivate your joy. Just in time for election season! Slap it on and let everyone know how you feel. All items ship free inside the continental United States! Overseas add $5.00.